I always give the Talking News teams Christmas and New Year off. I do those recordings myself, usually over two days. However, the main days have fallen awkwardly this year and I wanted all the listeners to get their recordings in a timely fashion. With Friday being a Bank Holiday, the chances were that people wouldn't get their memory sticks before Monday. So I decided that all four TNs would be recorded today, and posted today. That wouldn't have happened without Pauline's help. I got straight up this morning, got a new loaf of bread underway and then began recording the Lichfield TN. When that was finished I did Gwent. Whilst those masters were being created I went to the Sorting Office and found five full sacks waiting for me. Eighteen months ago it would have been one. We had lunch and then I recorded Scotland followed by Stevenage. Meanwhile Pauline was processing the returns, out in the garage. It's lucky the cold weather hasn't arrived yet (though it's on its way). I took the finished masters to the studio and duplicated. It took nearly two hours for all four TNs but I had everything at the Post Office for 5.15pm. Most of our listeners will get their talking news before New Year's Day. Back home, Pauline was shattered, so I did dinner and then we settled down for a couple of hours watching Last Vegas, a cleverly written film with some very smart dialogue, if you listen carefully. Today was full on and flat out, but it was also a good day. We've been discussing our daily routines and have both decided we need to start earlier, and do more, whilst we still can. Even after 74 years I still try to learn something new every day. Some days I learn more than others. Today I read an entire magazine and the only thing I learned from it (and actually I already knew) was that the starling population in the UK is down by a staggering 84%. I like starlings. They are much prettier close up than first perceived. They are also brave and can be quite entertaining. They can mimic a lot of sounds, even telephone rings. 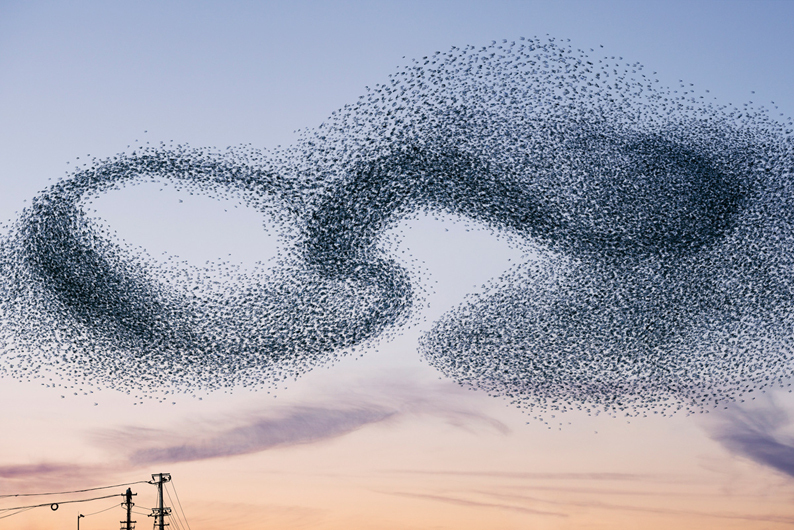 But the sight I miss are the murmurations. I used to be able to plot where the locals ones would take place. Every day the giant roost (up to 1 million birds) would break up and flocks would fly to the nearest towns and cities for the easy pickings. Every night these flocks would return and if you plotted the path of two or more and drew lines to see where they crossed, that would give the location of the roost. Then it was just a question of waiting until they performed their amazing displays. Brighton old pier was a great place to see them because it was in full view of so many people. I was down there with Daniel in March 2003. I photographed the starlings for ages. The next morning we drove back down to the sea front to find the pier had burned down overnight, and that was the end of that spectacular. Being a man, whenever I am driving I am never lost. Directionally challenged maybe, temporarily discombobulated perhaps, but never lost because wherever I happen to be, there I am. If only wives could understand that. Another big storm is on its way, so I got back out in the garden. The brown bin was nearly full and there's still a third to do, but that was enough for one day. 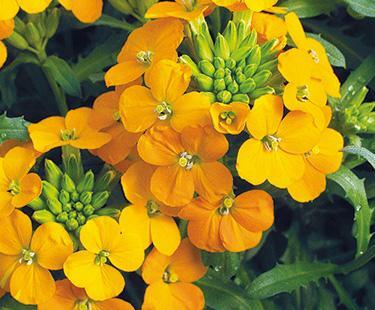 More flowers saw daylight, including primula and wallflower, and the robin has changed his winter song to that of springtime. The woodpigeon are courting, even though their nest is now in full view. Pauline managed a bit of food shopping, not without some discomfort but with more confidence than for seven weeks. We bought provisions for Rita and took it round, plus three meals that Pauline had cooked up and put on one side. She needs building up again. This afternoon we relaxed again, and I did another of the stamp albums. You can get quite absorbed. If I can find the time there will still be a lot of hours to get the collection completely right and evaluated, but I seem to be finding that time. Our plan is to change our morning habits, get up earlier, work hard all morning and then have our afternoons to our leisure. We are, after all, officially retired. It had been 15 degrees yesterday and looked to be on track for the same today, so I resolved to take advantage. 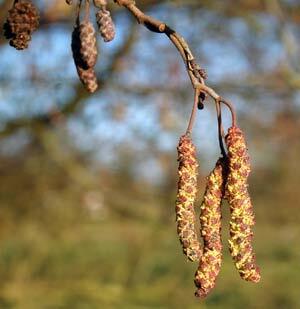 We have three large alder trees in the front and they didn't lose their leaves until a couple of weeks ago. Those that fell outside the walls have mostly blown away, but those in the back garden were forming deep piles. So I set to clearing the patio and borders. It was clear that it would take quite a few hours to do the job properly and I wasn't about to wear myself out entirely because I knew that if I did, Pauline would do too much as well. So I gave it a good hour and nearly filled the brown bin. After lunch I got Pauline settled and then got back to the stamp collection. I spent a good two hours and that was almost a full album done. There's more rain on the way so that will provide a few more hours in the days ahead. I had wanted to get back to my meandering, especially in Yorkshire but with what is happening in York and Leeds and some of the villages as well, I thought I would let the flood waters fall and people get over the shock of being forced out of their homes because we are enduring record rainfall. Normal service will be resumed - just not yet. It was daffodils yesterday. In our garden there are wallflowers in bloom, primroses, several bu7lbs sprouting through, and alders dangling catkins, far too soon. With excited little boys around, the house comes alive quickly enough. We all assembled for a last breakfast together and then the exodus got underway. Helen & Dave led the charge with Rob and Sheri a little behind them. We stayed another hour. Rita had spent Christmas with Ged and Margaret and had suffered somewhat with her hiatus hernia, so our intention was to stay on the M42 when we got that far and go up to Orton on the Hill. Well, that was the intention. Helen gave us a stream of traffic reports, particularly about the M25 car park. We set off at 11.30. The M23 was OK until just before Gatwick, and from then on it was nightmare time. The warning on the M25 was that the next four junctions would take an hour, so we went across country. Up the M40 and it looked as though we had done something clever, until we got to the Oxford turn off. So, the return journey took six hours and we didn't go to Orton. 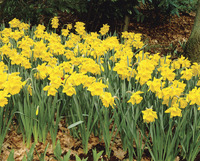 What we did see, however, was swathes of daffodils and even trees in blossom. Please confirm the date. 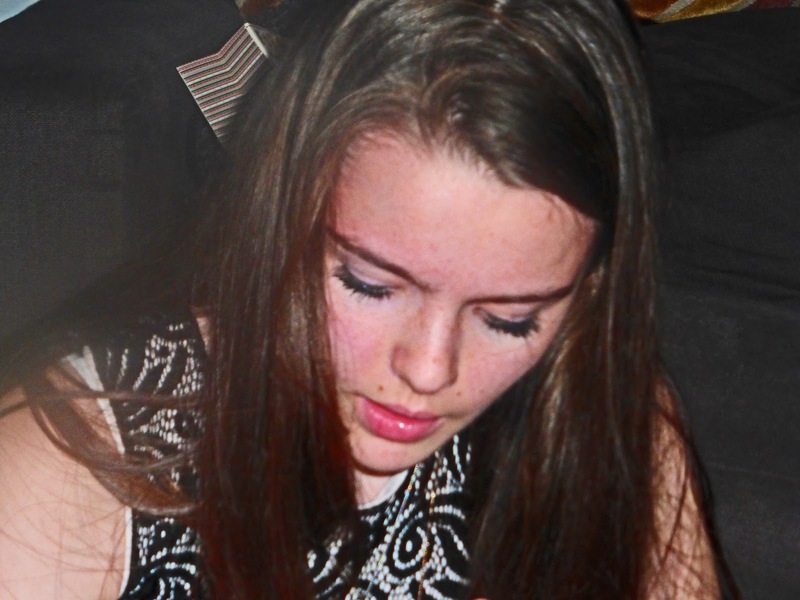 This close to New Year? Everybody was still full from yesterday, so those that could were sent for a walk. 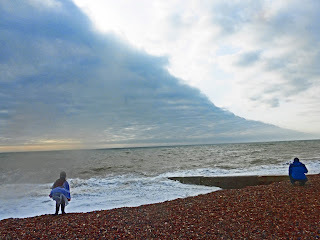 We went down to the sea, leaving the energetic ones at the skate park whilst some of us walked along the promenade.We have been coming down to Brighton regularly for 14 years and this was the roughest we have seen the sea. I brought the wrong lens down for my camera and so was left with just a pocket model that serves but rarely delivers. I couldn't capture the weather, but there was a weather front right above us and I tried to depict it. At 1.30pm we went up the road to the Stoneham pub on the Portland Road. Whilst not exactly spit and sawdust the first impression was of a basic establishment, but the welcome was excellent, the service from the young lady behind the bar was exemplary and the food was unexpectedly good. The gammon, egg and marmite chips was the best pub meal I've enjoyed for a long time. The afternoon was about the children, and a few adults sorting out anything electrical. There was another long, leisurely meal and a series of games intended to make the eldest one there seem thick, so I duly obliged. This has been our best family Christmas ever, and there's been some good ones. A beautiful day all day. We got up with two excited little boys and watched them open their stockings. There was a sumptuous breakfast of the Brighton version of eggs Benedict, then the adults opened their stockings. Rob, Sheri, Daisy and Harper arrived at 12.30 and Helen, Dave, Jessica and Megan were with us by 1pm. Ian arrived just before Christmas dinner was ready. We all sat down to a gorgeous meal. Meat and 5 vegetables is recommended. The turkey was perfect and there was roast potatoes, sprouts, sweet potatoes, cabbage, swede, parsnips and at least two I've forgotten. This afternoon the kids had their main presents. Ian left as the youngest four were being shepherded off to bed, and then it was time for the remaining eight to get their presents. Jessica, now towering over everybody except Dave and Rob, plus Megan who can be a church mouse, were happily included. It took till 10.30pm, by which time people wanted cheese in abundance! There doesn't have to be presents, just everybody together as harmoniously as this day. I had readied myself to accept we would be spending Christmas alone when Pauline got out of bed, went downstairs and put the kettle on. It was 6am. We had the tea and she said we would be going to Hove Actually. The question was, when should we leave? We should have gone yesterday and the news had been full of nightmare journeys and 5 hours spent in car parks. So we decided to make an early start and hope to get there in the daylight. There was just room in the car for us (never seen so many presents) and we were on the road at 8.06am. It was the easiest run we have ever known, despite rain and driving cross winds as tropical storm Eva battered away. We were knocking on the door at 11am. This afternoon we went to St Andrews church for the Crib Service. The church was packed. A full house of doting parents and dozens of children all in nativity or fancy dress. The service was lovely and full of fun. There was improvisation when one of the younger children went off for a cuddle with Baby Jesus, and some fast thinking when the other children responded and we finished with two babies in the crib. A lovely ham, egg and chips dinner, a visit from a friendly and interesting neighbour, an hour sorting stockings after the boys had gone to bed. That was enough. The plan was to shop for salad for Boxing Day, pop in and see Rita and then head south through the melee that is holiday traffic in present day Britain. Except Pauline was quite unwell, enough to warrant talking to the doctor and being prescribed steroids and antibiotics. 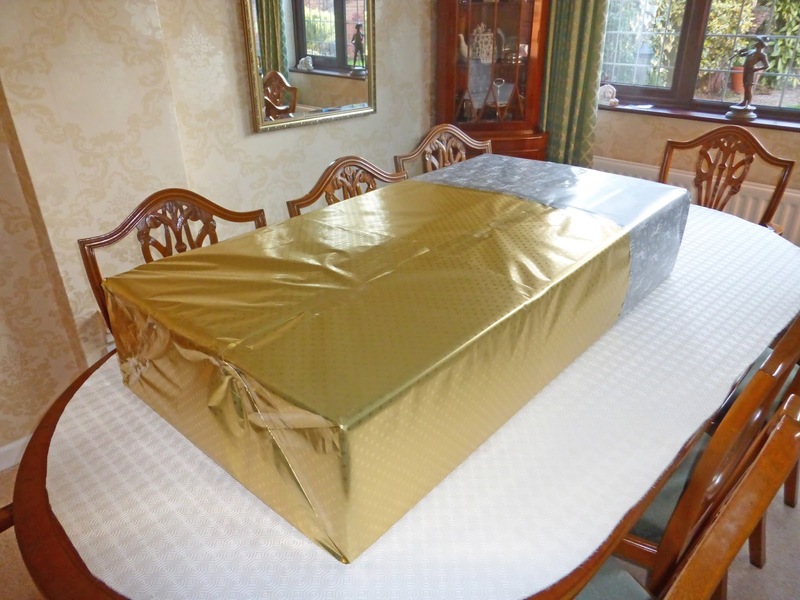 So I packaged three media players for yet more new listeners, tried foods that Pauline could keep down, and as unusually inactive for a Wednesday, except for wrapping the biggest present ever. I did book a weekend in Harrogate for the end of February so that Pauline can get a taste of the place herself, and I can do a proper job of exploration. 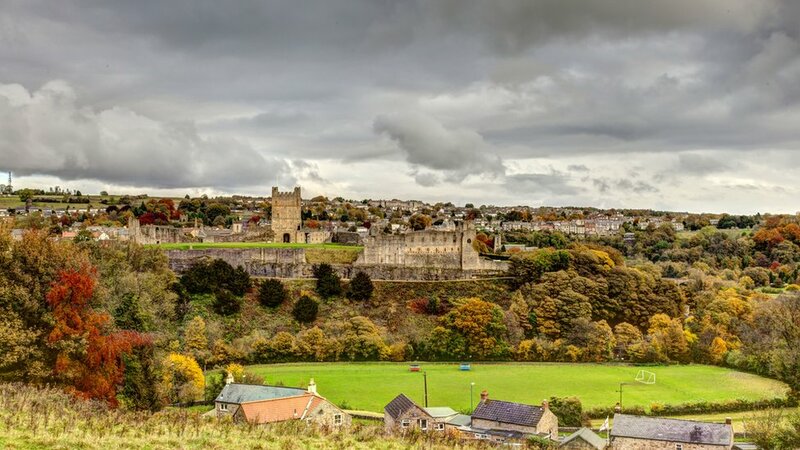 Richmond is another lovely place to visit, is also on the edge of the Dales, and has also been Britain's town of the year, and not that long ago. 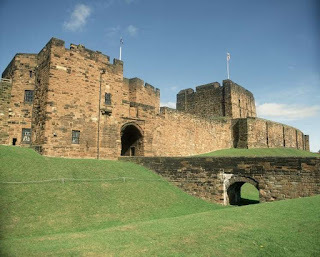 Richmond was created by the Norman conquerors back in 1071 and the new inhabitants immediately set about building a castle. Completed in 1086, much of it is still standing, especially the keep, but there are large gaps in the walls. Though mostly ruins, it is still a popular tourist attraction. I quickly settled all of the Talking News accounts, and then a delivery of 100 USB sticks arrived, with no invoice. I made sure that Pauline was OK and then went out to visit three new listeners, in Burntwood, Cannock and Brereton. The first lady was being inspected by the Fire & Rescue Service and they were installing fire alarms everywhere. They do a great job. All of our new people were happy chappies by the time I left them, and with the temperature up at 14 degrees and rising, it was a pleasant day for a drive. Pauline was not looking good when I got back, but it wasn't her leg. She has had a cough for a few days and it has clearly turned to a chest infection. 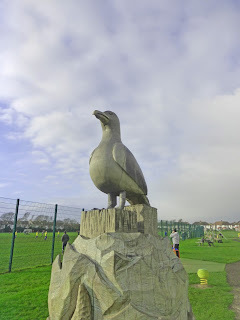 Our plans to travel down to Hove Actually looked in jeopardy. So did our event at County Hall in Stafford and I contacted Keith Eagland to say we wouldn't be going, and then I sent Pauline to bed, where she slept for 12 hours. I received details of one more new listener, in South Wales, so I processed her and then baked bread for Christmas. I'm planning to take Pauline to Harrogate in the Spring. I've been several times but never with Pauline. Harrogate is a gateway to the Yorkshire Dales National Park. It is an important conference and exhibition centre, is consistently voted the best place in Britain to live, and is officially the third most romantic destination in the world. 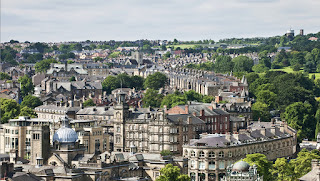 Harrogate has been around for a long time but it wasn't until 1626 when it was determined that the waters from the Tewit Well were rich in sulphur and iron that the town began to become known further afield. 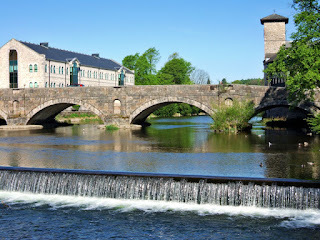 Gradually its reputation grew and in 1770 it was officially one of the most important spa towns to visit. Harrogate has the RHS Garden Harlow Carr within reach as well as a number of other historical attractions, apart from the glorious landscape of the Yorkshire Dales. Every effort has been made to keep the town in keeping with the local brick, but as you wander the streets and shops you are aware of all the wide spaces for greenery and flowers. 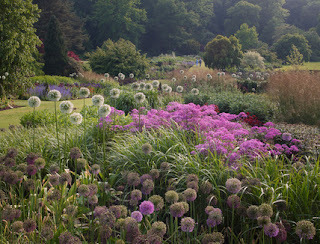 Well worth a visit anytime, but especially when the sun shines. The pet dog of a Yorkshire man died and he asked a jeweller to make a gold replica of the dog so that he could always remember him. “Do you want him 18 carat?” asked the vet. I finally got the breakthrough I've needed. For months there have been major (to me) tasks that I seemed unable to complete, but sticking close to home to look after Pauline helped and I cleared the last obstacle today. It took a couple of hours. I also used my new toy again and made a gingerbread. I was happy with the result, which doesn't mean I won't weak things next time. Gill and Paul came over just after lunch and stayed a couple of hours. I cooked a stir fry meal, Peter Fox called in, attracted by the aroma (actually to copy files off my computer) and then I hid myself in the dining room and packaged all of Pauline's Christmas presents. There won't be room in the car for her. I had intended going over to Tamworth for an hour this evening but Pauline had overdone it this morning and was paying the penalty. The doctor told her to start walking again, but ease her way in. She tried today with crutches. As cities go, Ripon is even smaller than Lichfield. It is also a market town. For most of British history a town could only be a city if it had a cathedral. Birmingham had to rename a church as a cathedral in order to get city status. Yet there are places like Lichfield, St Asaph, St David's and Ripon that barely qualify as towns, yet they have the magic of a cathedral. Ripon has been there for well over1300 years. The first stone church was begun in 672, but that replaced a wooden monastery. The cathedral evolved from the church and although it has been rejiggered constantly over the centuries, much of it is at least 800 years old. Ripon is popular with horse race goers, but tourists also flock to the region because of the World Heritage Site which includes the likes of the Studley Royal Park and the ruins of Fountains Abbey. Come the New Year I will put more meat on the bones of my place recollections. So today was going to be a day off and the unofficial start of Christmas. The early indication was that the high of 17 degrees might be broken. There was a blue sky, few clouds and no wind. Sue called for Pauline, then for Rita and took them both to church. I decided to walk to the shops to get flowers, which was the signal for change. The temperature dropped to 8 and the rain came down. An hour later we were driving through sunshine to Orton on the Hill and dinner with Ged & Margaret, plus John and Lesley. We exchanged belated birthday presents, then pre Christmas presents, enjoyed one of Margaret's fabled dinners and caught up on the past year. Despite being only 16 miles away, we don't get together all hat often. This was a very pleasant day. We knew Orton on the Hill long before Ged and Margaret found it. Our first house, some 44 years ago, was at Dordon which, together with Polesworth, is down the hill to the west. I used to go to the Unicorn pub once a week with John Richards from work and we would play dominoes until the shooting range was free. This was the only pub I ever heard of where you could take a 22 rifle and blast away 100 rounds, and still enjoy a pint! Ged and Margaret moved around a bit at first after they were married but eventually settled in Orton and the quaint church of St Edith of Polesworth was the venue for the christening of both Emma and Amy, plus Louise and Neil married there just a couple of years ago. Orton is a hamlet that sits high above the spot where four counties join. Two of the fields on the approach from Austrey are as big as any you will find in the Midlands and will provide me with some great photos when I can get around to it. The place was there before the Norman Conquest and features in the Domesday Book. It never developed, possibly because the Romans had built the Watling Street just a few miles to the south and traffic never strayed that far. The church boasts a triple decker pulpit, the only one I've ever come across. The interior looks older than it really is, mainly because it has never been updated. I'd written a note in my diary to remind me to do something, then couldn't find my diary. When I did the note said "Keep your diary with you to remind you of things to do - like not losing your diary." It must be my age. Hopefully the last big day of the year. No chance today but I was hopeful that the next three days would see the workload on my desk diminish. First there was the house to see to. 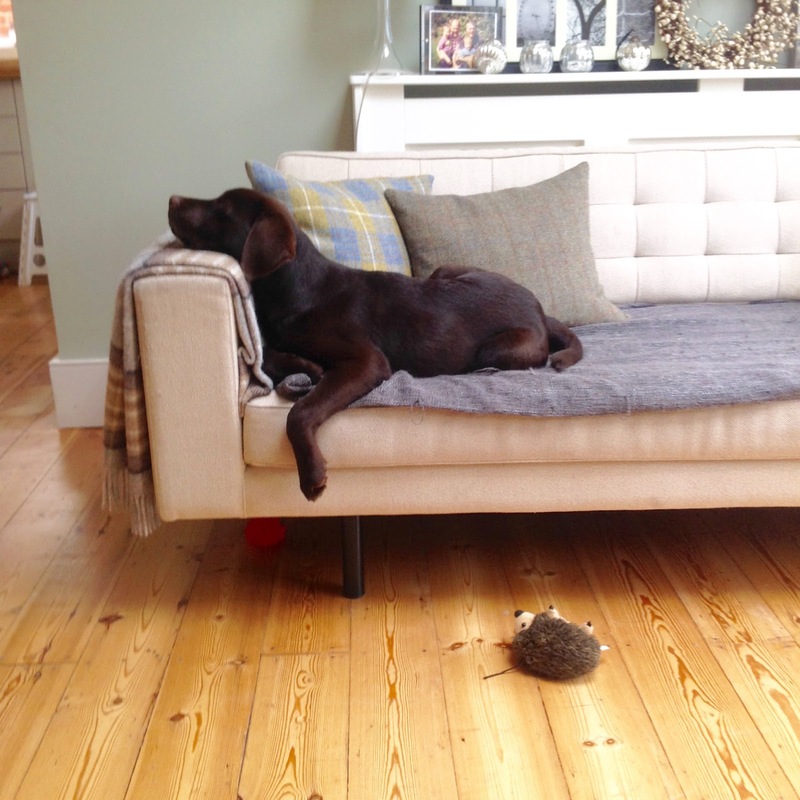 Our house is very clean by many standards but Pauline normally sees to that and I have been swamped this week. So today I got the vacuum out and did a proper job. This unseasonal weather has brought dust up from the Sahara and it gets everywhere. Rita rang to say she had forgotten milk and a couple of other food products so as soon as everywhere was gleaming again I went and did that little bit for her. Meanwhile Pauline was trying her foot out again. She kept it up until her face went white and I made her stop. This afternoon I was on duty with Barton under Needwood Lions, selling raffle tickets at the Berkeley Garden Centre. Business was five times brisker than at Wyevale. Maybe it was the novelty factor but people seemed keen to stop for a chat, and we relieved them of a pound whilst they did that. Back home, Pauline had tried to start dinner but had sensibly left it for me. Chicken breasts and roast sweet potatoes. Very nice, but we were both very tired and had an early night. I have lived in Lichfield for over 40 years, but had never had cause to pass through the hamlet of Dunstall, just to the north of Barton under Needwood. Today I was hemmed in by roadworks and decided to try to avoid them by taking a lane I had never even noticed before. It took me to Dunstall and the first thing that struck me was how lovely and different the church is. Perhaps in the summer I will go back and explore more thoroughly and take better pictures, but I did what I could today. The population of Dunstall is under 100. 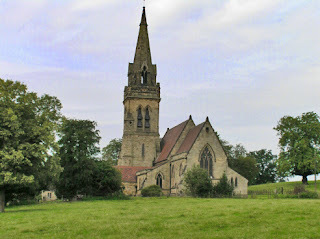 The church was consecrated in 1853, having been built by the Arkwright family. There is a striking stained glass window and the stone floor was replaced by oak blocks. Although relatively new in church terms in Britain, the church is nevertheless rregarded as being of historical interest and value and there are constant efforts to keep the church alive, achieved in part by importing some of the congregation. Last Christmas I was gifted Tony Blackburn's Compendium of Witticisms. The pages were blank. He's still trying but the pages are still blank. Some good news at last. I got us both up and ready, took 5 sacks of recordings to the Sorting Office (the Talking News grows by the day) and then drove us both over to Queens Hospital at Burton upon Trent. The doctor declared that Pauline's fracture is now mended and that she needs to learn to walk again. He warned it might be painful at first because her muscles in her left leg have not been used for 6 weeks. He was right! On the way back we called in on Rita, helped her pack for her Christmas break with Ged and Margaret, and then brought her back for lunch and dinner. I did some shopping for her, only forgetting one thing, and then finished this week's minutes. I sent the SNA minutes out, composed those for the Lions and finally got that job out of the way. Then it was time for dinner. I gave the ladies a gin and tonic each to keep them quiet and then cooked a long laboured risotto, because I can. 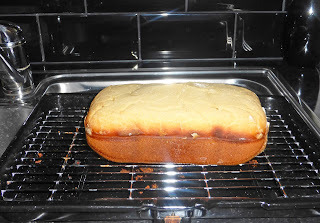 I also baked my first loaf of bread in my new machine and was well pleased with the result. It might not look pretty but it tasted ten times better than store bought gluten free cardboard. 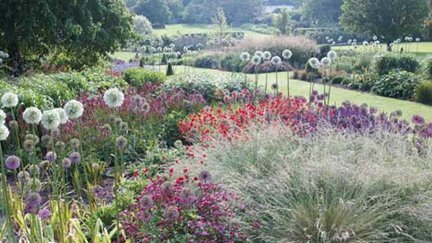 I was helping out at Saga Radio for a few years in my spare time and one of the venues they sent me to was the RHS Garden Harlow Carr. This proved to be a delight and I can only wish it was a tad closer to Lichfield because this is one of those places where you want to visit season by season, because it will always be different. We worked hard over the weekend that I was there but I did find a little time to dash around and take in some of the sights. One day, when we are rich, famous and retired, I will go back for a leisurely look. And the doctor said to Pauline, "Cast out thy crutches, release thy bonds and let John get back to his proper life." - or words to that effect. This was a normal Thursday, without some of the help. I was supposed to go to a meeting in Stoke on Trent, but that eats up three hours that I hadn't got because I'd been unable to get that far ahead. So instead I did the recording of the Stevenage Talking News, and that took me to mid day. The Live at Home Scheme had an early start this week because local school children were going to sing carols, plus Tesco was there to hand out goodies. In between taking and fetching them I took some shopping round to Rita. I got to the studio a little after 5.30 and got on with the Gwent TN. I added the magazines and finished that off, but Peter O'Brien and his team had forgotten the Scottish News, and as I didn't know, it was much too late. Wilf came on time but Keith was off in Stafford escorting his lady on official Chairman of the County Council business. Fortunately Ben came to process Lichfield. David was missing because he is getting over treatment and Peter Fox didn't make it for the first time that I can remember (when not on holiday). 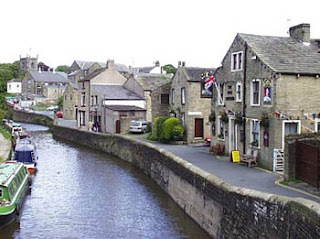 We went to Skipton a few times because Pauline's Uncle Ged lived there. He was a retired priest and a lovely man. Skipton suited him. The town is listed in the Domesday Book, and that was compiled in 1086. 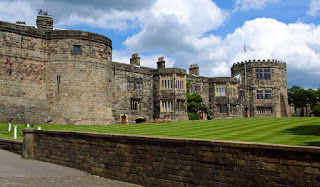 Skipton is beautifully placed to allow access to the North Yorkshire Dales. It is also a kind of crossroads for those heading for Liverpool or the Lake District. Being over 1000 years in standing it had the obligatory castle. This is in surprisingly good shape for a building well over 900 years old. The same can't be said for the mills that were once handling all the local corn, although they still exist, but as housing. Skipton became an important market town. That importance has now been overshadowed by the tourist industry and this pretty town attracts a lot of holiday makers. A busy canal that splits in two mid town helps, as does the fact that local stone is still used on most buildings, and that has ensured a historical feel to the place. Please take note: Million to one shots come off all the time. There is no recorded instance of a 999,999 to one shot winning. Just trying to save you money. I got up early and started on the minutes from the SNA meeting. I paid a supplier to the Talking News and then processed seven new listeners. That took me to lunchtime, and then another new one came in. I downloaded all the news for tonight for Scotland and Wales and we had lunch. Pauline was desperate to try Aldi so that's where we went after lunch, buying enough food to see us through to Christmas. Then it was the Sorting Office where there were five sacks waiting for me. It took all afternoon to process the returns and then I took all the news to the studio for Peter O'Brien. I thought he would be there at 5pm. I waited until 5.20 but then had a few more short errands to run. When I got back Pauline had cooked the dinner, for the first time in five weeks. I'm trying to say I'm busy. I'm supposed to be winding down, but it isn't happening. Still, with 14 degrees in mid December I may as well mow the lawn. I went for Caterina Page at 9.30 and took her up to Morrison's. Caterina is totally blind and is the greatest advocate you could find. She charms everyone and is full of fun. It was her birthday Saturday. We think she is 88. If she is, I hope I'm as compos mentis if I ever get that far. Morrisons's presented us with a cheque for £5000, which was very gratefully received, but I don't remember applying to them, so it was doubly welcome. This afternoon was the monthly meeting of the Staffordshire Neurological Alliance. There were seven of us there and I thought the meeting was purposeful and the SNA seem to be making genuine headway. My only problem was when would I be able to do the minutes? 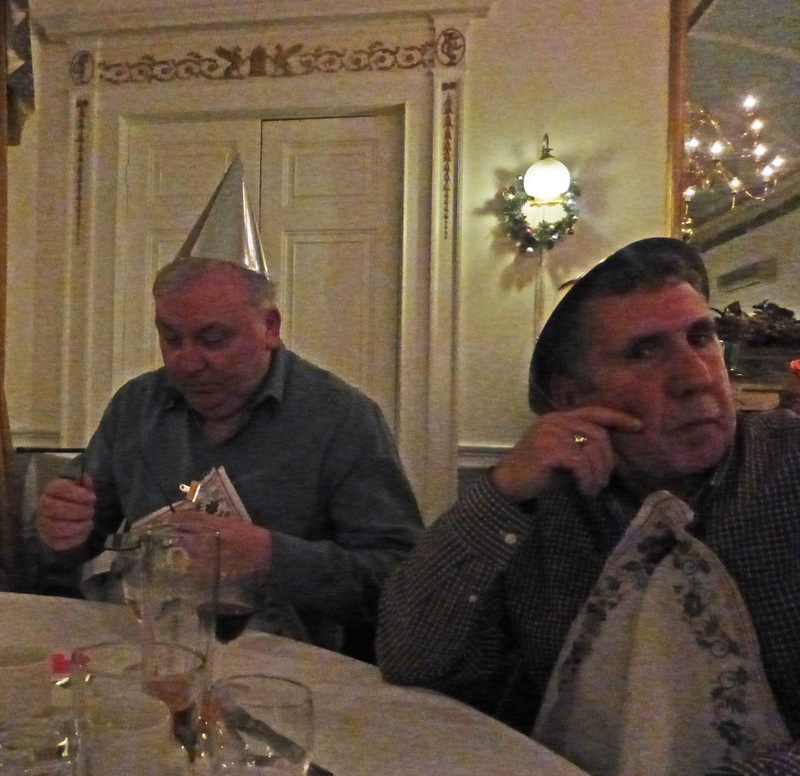 Tonight was the Christmas Dinner for the St Chad Rotary Club of Lichfield at the George. We were on a table with Keith & Janet Eagland, Robert Yardley (photographer), Maureen Humphries plus Peter Fox and a friend whose name I never got. The meal was good, the company was very enjoyable and the entertainment was a bit dated. Keith was happy but Peter was very much turned off. No matter, the Rotary gave him £250 which he immediately passed over to me for the Talking News. Spent tonight in the company of Lichfield's top photographer. I knew him 30 years ago and taught him all I know. Then he ditched all that and learned how to do it properly. We heard the boys downstairs so I went down to see what they were up to. They had fed Tilly the cat and Jackson the dog and made tea and were about to carry cups up two flights of stairs to Grandma and me. Plus a chocolate biscuit each. We had a pleasant morning with very few issues. The sun was trying hard to break through and the wind was actually warm so I took both boys down to the nearby park to let off some steam. 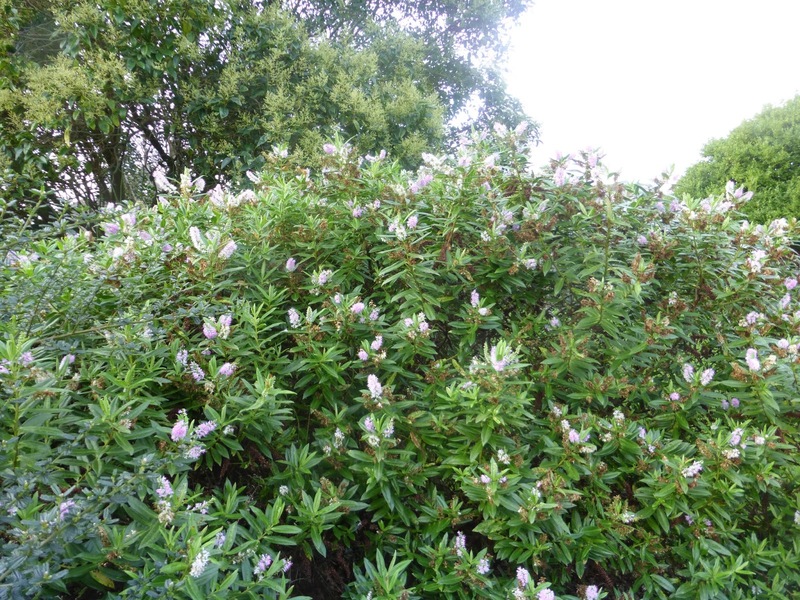 That was over too quickly so we diverted to a different park, where I found a hebe in flower, in mid December! Dan and Gary got back late morning and our stint was over. 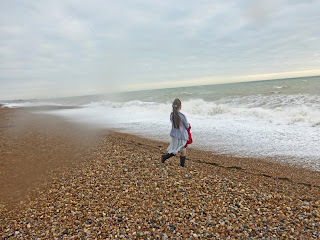 The afternoon was gentle and then they had to visit friends for an hour, so I took Pauline down to Marks & Spencer's in Shoreham, because she craves shops. We also had a pleasant hour or so. 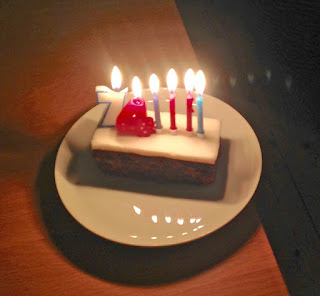 Back home, Dan cooked a meal and then they piped in a birthday cake. I didn't mind in the least especially when I got presents. D&G bought me a warm, enveloping dressing gown, but Pauline had picked the one thing that I really wanted - a new bread maker. So long the cardboard that the big stores sell as gluten free. Well, there's no time for thinking let alone writing up a blog when someone my age is left to entertain two hyperactive little boys. Dan and Gary made their escape and we didn't have any tears for at least three minutes. Pauline is a past master at diverting young minds and keeping the boys occupied. They have got enough Lego to build an extension to the house. Reece was creative for well over two hours. 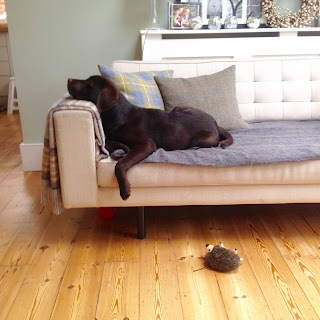 Tilly stays clear of downstairs during the day and all Jackson wanted to do was sleep. Roan and I went for a walk. It was entertaining. He showed me a different park and then we explored all the shops in the area, finally buying nougat for the boys, white chocolate for Pauline and a comic apiece. Bedtime was interesting because Roan declared himself upset because Poppa and Daddy never go away without leaving something. I said they had left something. They call them Reece and Roan. There were no histrionics but I did have to sit and talk gently to Roan for about 45 minutes. Would we do it again? Of course. The sun was shining in Lichfield. I got a suitcase down for Pauline to pack (she's still on one leg but is hopping with more experience) and I took four sacks to the Sorting Office, a load of rubbish to the tip and then filled the tank. At 11.30 we set off on the 200 mile journey down to Hove Actually. 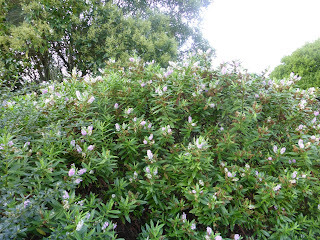 We hadn't gone far when the rain set in and at one stage we were driving through a cloud. We stopped off at High Wycombe for a coffee with Helen. The M25 bit was not the normal nightmare, except for some excitement when a car with Polish plates started weaving across the motorway at high speed. A big SUV came out of nowhere and stuck to his bumper. We nearly got side swiped but got a friendly wave from the pursuers, who had Police stamped all over them. Down in Hove for 4pm for a friendly greeting from Roan, Reece and Jackson the Labrador. Our purpose is to look after the boys (and Jackson) whilst Dan and Gary go and party with everyone from Ramsac. Can't blame them for going. Can't wait for them to come back. Actually, it's a treat to get quality tome with the boys. Keeping them focused is the trick. There'll be no time for meandering until we get back home, that's for sure. There's not enough of the real thing? Only three or more big days before Christmas, but this was the biggest, though it doesn't look that much when written down. I got breakfast and downloaded the rest of the magazines. I recorded the Stevenage Talking News whilst Lisa coiffed all and sundry, myself included. I made lunch and then took Rita to Tesco's. I collected Alan and took him to the Live at Home Scheme, dropped a repeat prescription off at the surgery for Pauline, took collecting buckets to John Whitehouse, went into town and bought Pauline's main present, found Rita at Tesco, helped her finish her shopping, took her home, collected the Lichfield Metcury and cut it up for tonight, took Alan back home, cooked dinner, got to the studio for 5.30pm. Wilf joined me at 6.15 and Keith was not far behind. We had a full team of readers, Ben was there, Peter arrived as the reading was finished, we filled four full sacks and all went home. Pauline said "Did you remember to water the hanging basket?" Flat out all day. I started by downloading the news for Scotland and then South Wales. Next I processed two more new listeners. I produced the agenda for next week's Lions meeting and also got the final instructions away for Sunday and Father Christmas in Fradley. Pauline was out to lunch with the girls. I took her to The George and then went to the Sorting Office where they had 5 sacks of returns. I cooked myself a nice meal and then started processing the returns. It took 3 hours and that was the afternoon gone. I took the news to the studio and chatted to Peter about the plans for Christmas week (I will do all the editions that week) and then came back for an hour of the Comedy Road Show to cheer us both up. Five comedians, all funny and all fresh material. Very satisfying. 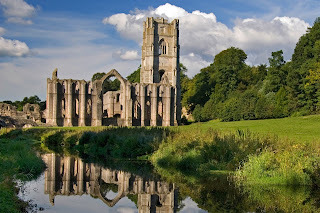 Now we go to North Yorkshire and as we move south the visits were more frequent and often more detailed. 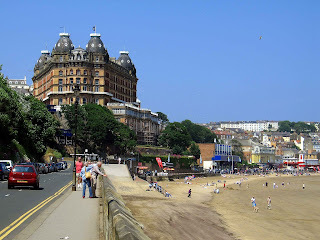 I'll start with Scarborough because that evokes special memories. About 30 or more years ago the Lions started to take a coach load of OAPs to York for a day. We got to see a lot of that city. We had been doing it for a couple of years when Scarborough Lions told us of an hotel that would take disadvantaged kids for a week, some 13 different groups over 13 weeks of summer. We thought it was a great and altruistic idea and toured the schools looking for 12 kids to take. This we did. What we found was that some of the were neglected but the majority had as much (if not more) pocket money than most kids and it wasn't hitting all the notes. I asked if they would take special needs kids and they said they'd try it. So I went to Rocklands Special School (this is how became a governor there - for 30 years) and we made up a group of 12, top be accompanied by two teachers. We put 30 seniors on the coach and then the kids. I'd worried about reactions but everything was brilliant. The kids were soon going around and sitting with and chatting to the mostly old ladies. 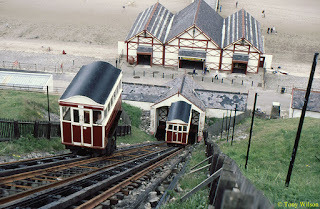 We dropped the seniors in York for a few hours and I carried on up to Scarborough to the hotel, which was situated on the cliff top not far from the funicular railway that serves the beach. We settled the kids in and I had a little time to look around the town, then it was back to York to take the seniors home. The following week we took another 30 seniors to York and then I went up to Scarborough to collect the kids. At the hotel I was met by two worried faces as the management greeted me. I asked if there'd been problems and they said that the kids had been brilliant, much better than 'normal' children. They said that the children were lovely and lovable and they'd do it again, but they'd eaten more than twice the weekly allowance. I laughed and paid the hotel another £70 (quite a bit 30 years ago) and said that was a feature of Downs Syndrome. I asked where everyone was and was told they were down at the beach hut. I didn't expect them to remember me (a misconception) even though we'd spent a lot of time together on the 4 hour journey up to Scarborough. 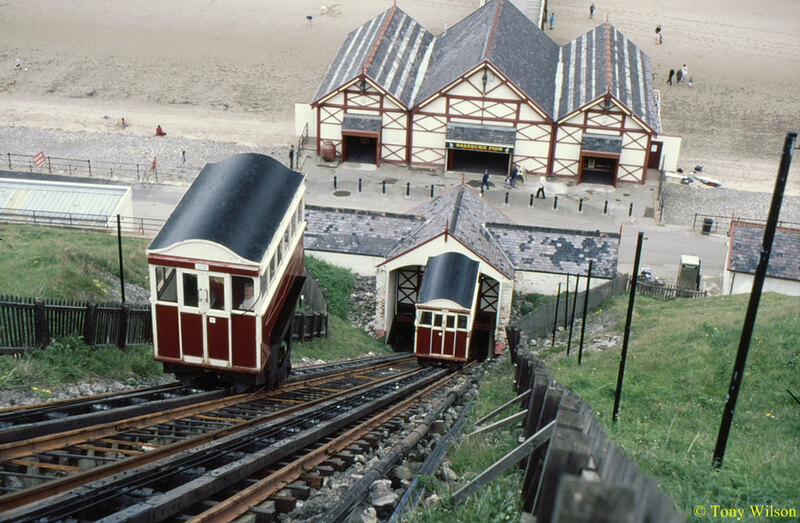 I got to the top of the funicular and a carriage was on its way up. There was a shout of "There's John." And suddenly there were arms out of the Windows waving at me and they all ran for a cuddle when they got out. We bonded on that journey and I became a small part of the school, right up until last year. One of the boys became famous as a marathon runner, not only competing in the London Marathon but even travelling to Berlin as a guest of the Germans to run with Downs children over there. Scarborough looked lovely from the cliff top. 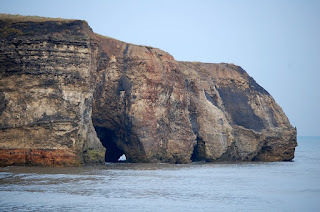 A horseshoe beach framed by rugged cliffs wrapping round a friendly, old fashioned seaside town. There was the obligatory castle, but that was in ruins, and the dominant feature was the large Majestic hotel looming over the town. 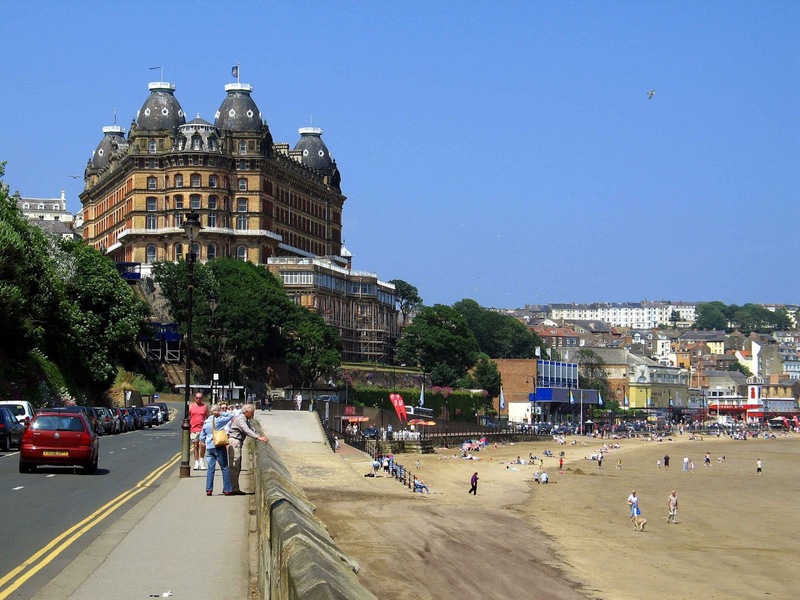 The beach was fine sand and, along with Whitby, a popular seaside resort with people in the north east. 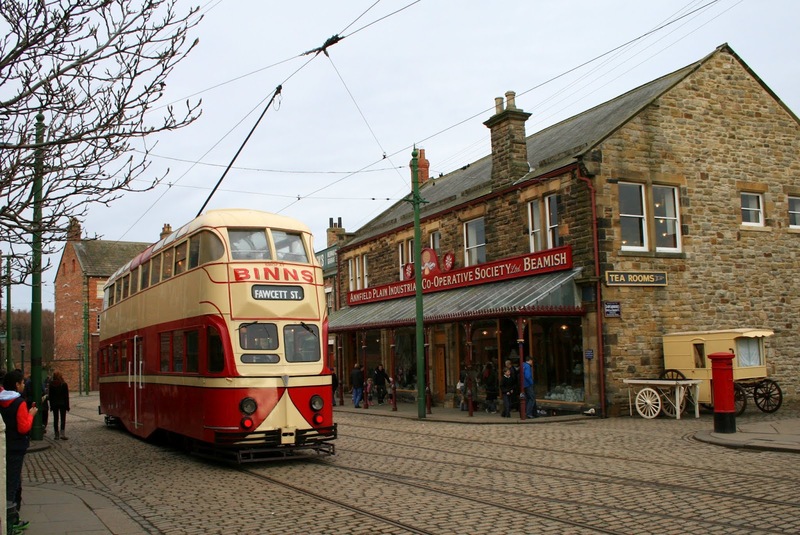 If you go to Scarborough today you can still enjoy a traditional seaside holiday and there is still the castle ruins to explore, plus the enigmatic North Bay Railway, Rotunda Museum or Peasholm Park for the outdoor type, and the surrounding countryside and cliff top walks for the more energetic. I like to play the guitar and sing country songs. I'm no good at the guitar but that doesn't matter because I can't sing, so the one balances out the other. With Wednesday and Thursday looming I decided I would take it easier today, and I did get some time off. The morning was busy and I did have to make a dash out for food (I shop the old fashioned way - buy fresh and when you need it). I processed two new listeners and took delivery of some more media players. We're OK now for a couple of months at least. After lunch I had another go at the stamp collection. I'd put it on one side a long time ago because the albums weren't up to date. Having rectified that I was surprised at how many stamps need to find a home. Three albums down, three more to go (not counting the First Day Issues albums, of which there are at least seven). Still, it's nice to have a hobby. 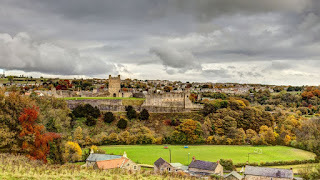 Barnard Castle is a small town in Durham that is as famous for the people who visited it as it is for anything else. 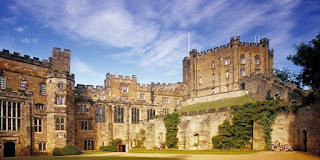 When the Normans installed Bishop Walcher at Durham Castle they were hoping for some stability in the region. When the bishop was murdered they reacted swiftly, splitting the entire region into manageable packages and imposing a stricter rule. A fortification was established where the town now stands and eventually it became a full blown castle. The town grew around it. The castle's demise began a lot sooner than most and it has been a ruin for several hundred years. 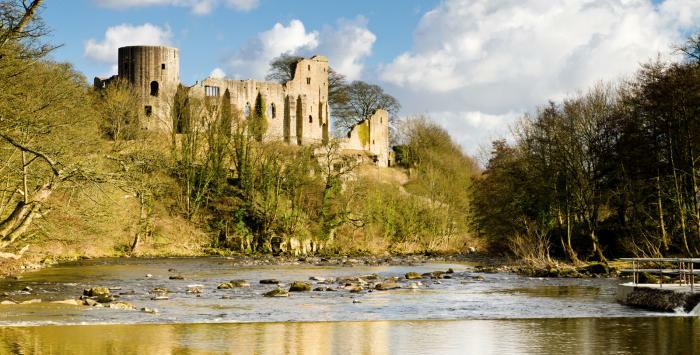 Now maintained by English Heritage, there is enough left to make you appreciate its size and scale, and the beautiful views it commanded over the River Tees. 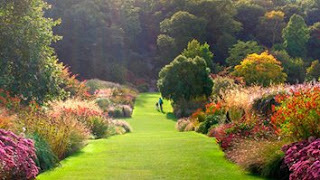 The town is worth a visit and the castle does still have attractions, and there is a pleasant sensory garden. 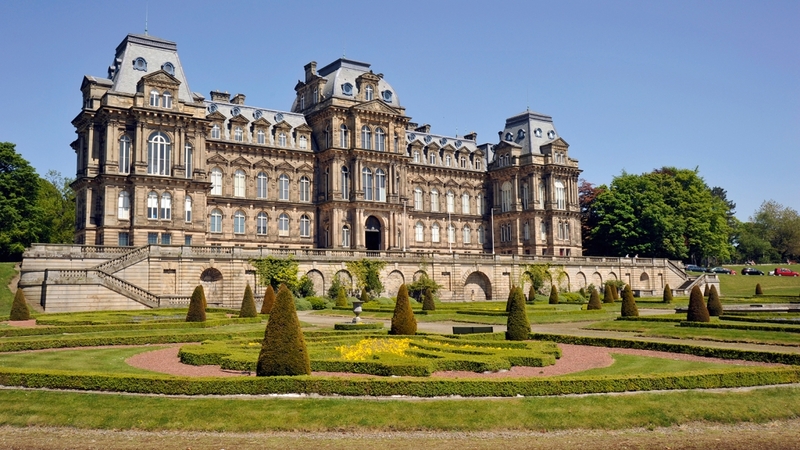 The Bowes Museum is probably the main attraction in the area. It was built later than many people perceive. John Bowes married the Countess Josephine Chevalier and together they planned a magnificent French Chateau in the north east of England. Sadly both died before the building was completed in 1892. The Bowes were very wealthy and left at least 800 paintings. The chateau became a museum and now displays clocks, costumes, ceramics, tapestries and textiles, but the stars of the show are the magnificent paintings by the likes of Canaletto, El Greco and Goya. My teacher taught me everything I know. Sadly he couldn't teach me everything that he knows. Happy birthday to our lovely Jessica. 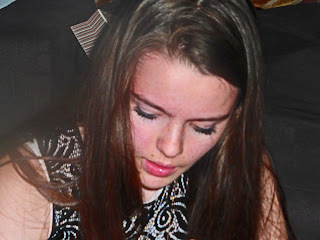 Fifteen today and the tallest female in our family - for the moment. I was going to declare this to be a very happy day. It almost was. I felt chains dropping off today. I sorted over 60 e-mails and confirmed that we have 20 helpers for next Sunday. I got Pauline settled in reaching distance of the ironing and Christmas cards, so then I went out. There were three listeners to see in Lichfield, two in Burntwood, one in Hednesford and Hill Ridware, and a new listener in Alrewas. By the time I got home there were eight happy people all delighted with their new sonic media players. I called on a 92 year old lady. A friend opened the door, I said who I was and my lady shouted to let me in - "pass friend and be recognised!". A 92 year old lady who has legs that don't work and eyes that can't see, but an indomitable spirit. I asked her to confirm her birthday details and she said I knew what they were and hold old she is. I was concentrating at the time and heard myself about to say "Yes, but your not as old as you look." I realised I'd got that back to front and stopped at "You're not as old as..." "your jokes!" She finished. Back home I did a simple meal of salad with home made dressing coupled with roast butternut squash and feta cheese. It was all going so well. We'd just gone to bed when the phone rang. Nick was in a panic. Charlotte was having palpitations and chest pains. The First Responders were elsewhere and the 111 service didn't know when an ambulance would be available, so I took them to Burton A&E. Given that Charlotte's Mom was a heart transplant patient, Nick was taking no chances. Charlotte had an ECG and blood tests and was in bed waiting for a doctor when Nick said I could go home. I waited an hour and a half but then left with the instructions to take a taxi if allowed out of hospital and we would sort the bill. Durham has a beautiful cathedral and an ancient castle and together these give the city a unique skyline, if you can find the right vantage point. The cathedral was founded in the year 1093. 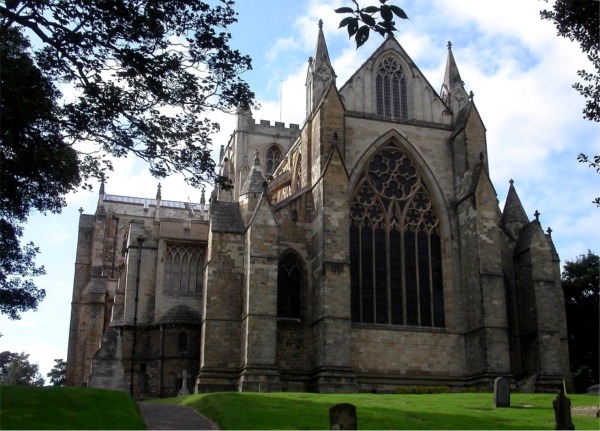 There are some peculiar relics held at the cathedral, apart from 3 copies of the Magna Carta. There are the remains of St Cuthbert, the head of St Oswald of Northumbria, and what is left of the Venerable Bede. It can be argued that every cathedral is similar and every one is unique. The art is in taking time to examine every nook and cranny and to look at all the artwork, particularly the carvings. Studying Lichfield Cathedral gave me the taste for closer examinations, and they pay off. 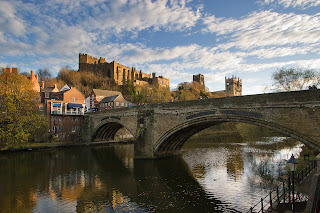 The Normans weren't slow in starting to build Durham Castle. The north of England has always needed more protection, a fact recognised by the Romans and every power since then. Perhaps unusually the castle was placed under the authority of the Bishop of Durham. 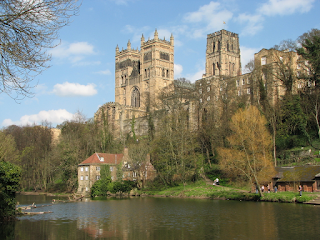 The church maintained control until 1837 when it was gifted to the University of Durham. Three years later the first 100 students moved in and it still houses students to this day. Not many universities boast their own castle, though many could do with one. In theory there is no difference between theory and practice, but in practise there is, theoretically. They said the sun might shine today. Instead half of Cumbria was underwater. I hope that wasn't my fault because Durham is next under the microscope and it's not that far away. I needed a few things from the shops and Pauline needed to get out so we took the wheelchair up to Tesco. We were back in time for me to start on the dinner. Rita joined us as I fought my way through my first lasagne. I followed a recipe. Pauline, of course, kept overseeing and saying "It would be quicker if you use a can of sauce." which I'm told is par for the course for any man playing in a woman's kitchen. In the end I did it my way and I'd do it again. This afternoon was another stint at Wyevale. 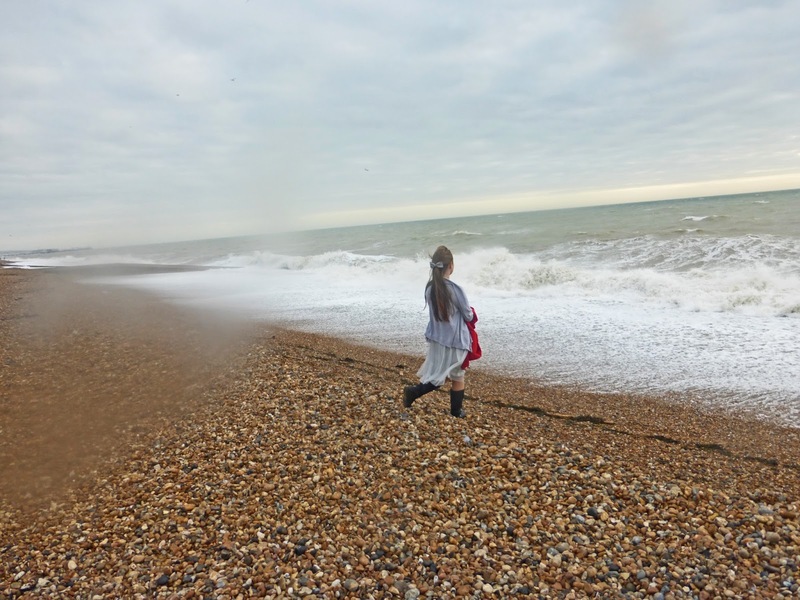 This time it was with Zoe and very little wind. It was a pleasant afternoon and people were again generous without being asked. We did all right. My next trip up to Durham was courtesy of Skoda. They conducted a new car launch from what was then a fledgling Seaham Hall. Today the place looks much the same but standards have been raised and now the hotel is award winning. I remember the approach and the artistic courtyard. There were lots of attempts at art deco and such inside. Over a 14 year period I attended hundreds of car launches and many were from stately homes or top rate hotels. 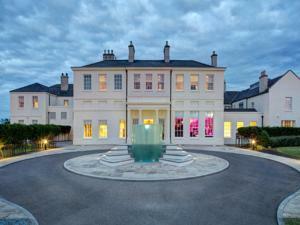 Seaham Hall was different from anything we'd experienced to that point. Whenever I visit a new place, if we get chance to talk to the locals I question them about the area. 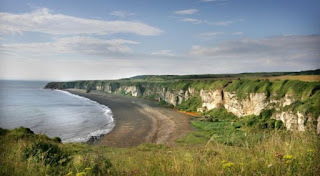 When I asked about Seaham and what there was to see I was told not to bother, at least for a few years. I later found out what that meant. The area from Seaham down the coast to Crimden was all coal mining, and the miners found it very easy to tip the slag over the cliff. This resulted in blackened cliffs, even darker beaches and a barren stretch of wasteland. The local authorities got together as the mines started to close from the late 80s to the early 90s. They began a programme of footpath construction and a mass clean up. There is still evidence of the crimes but it is fast disappearing. 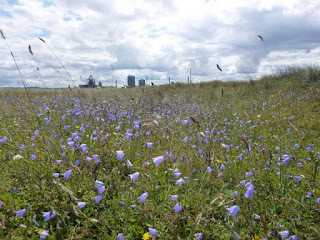 If you have the time you can walk 11 miles from Seaham down to Crimden enjoying a plethora of wildflowers, beaches that are becoming ever more attractive, cliffs of real character, and rare wildlife such as the little tern and the Northern Brown Argus butterfly. I've solved the Confucius warning "Beware the yellow peril coming from the east." It's the sun, bringing storms, pollution and global warming. No wonder we didn't see it this summer. It was ashamed to show its face. This morning was very busy. I did another batch of media players, took three full boxes to the studio and two full sacks to the Post Office. Then it was back home to strip the bed, get the washing on and clean upstairs (Pauline style, not my flick and polish). After lunch I took Pauline and Rita over to Orton on the Hill for a baby shower for Louise and Neil. In battering winds I then went over to Wyevale for 90 minutes shaking buckets with Laura. People were very generous, but maybe that was sympathy because of the conditions. 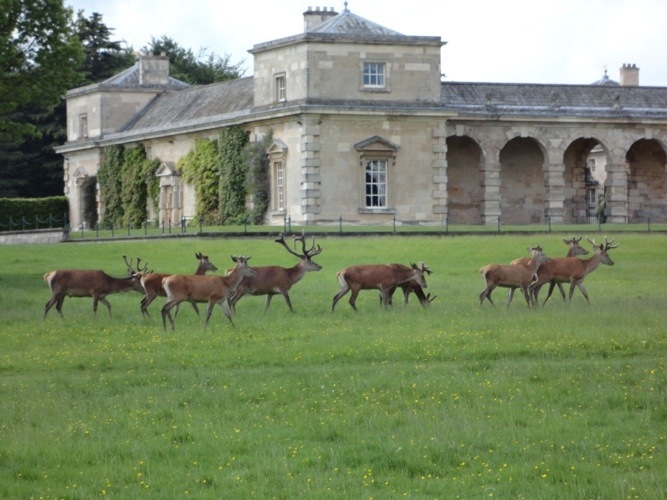 Back over to Orton to collect the ladies, say hello to the Whitehouses, and battle back. About 90 miles all told. 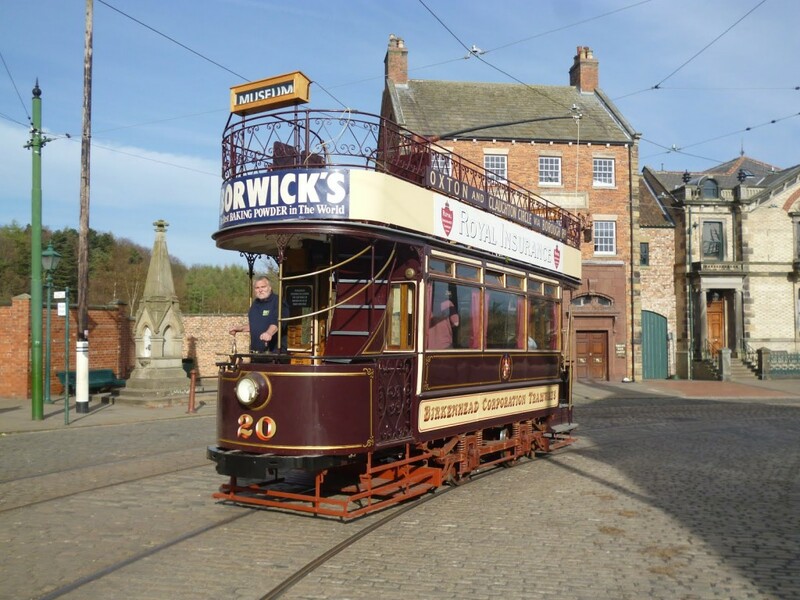 The first time I went to Durham was about 35 years ago and we went to Beamish. This museum was a revelation to me, I'd seen nothing like it. History reconstructed with shops, houses, trams, buses and ancient cars. 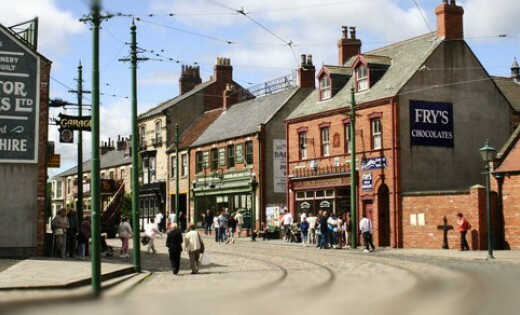 Nowadays I think the Black Country Museum and Blists Hill are equal to the challenge, but that is quite some challenge and the Beamish Museum is well worth a visit. Today's the day I got to shake my thing. A bucket that is, at Wyevale, with my Lion's begging face on. Early sunshine, but puddles everywhere. Such a lot to do but at least Pauline would be getting out of the house. I started by cleaning windows and then took the recordings to the Post Office. Kath came to take Pauline to the little cinema at Barton Marina to watch The Lady in the Van. I went into town and bought a Christmas present, then some veg for later. Back home I cleaned downstairs and then seven boxes of media players arrived. I got started on them straight away. It took nearly three hours but I packaged and addressed fourteen of them, leaving the rest till tomorrow because Pauline came home. I'd put a casserole into play, and that turned out to be just right. 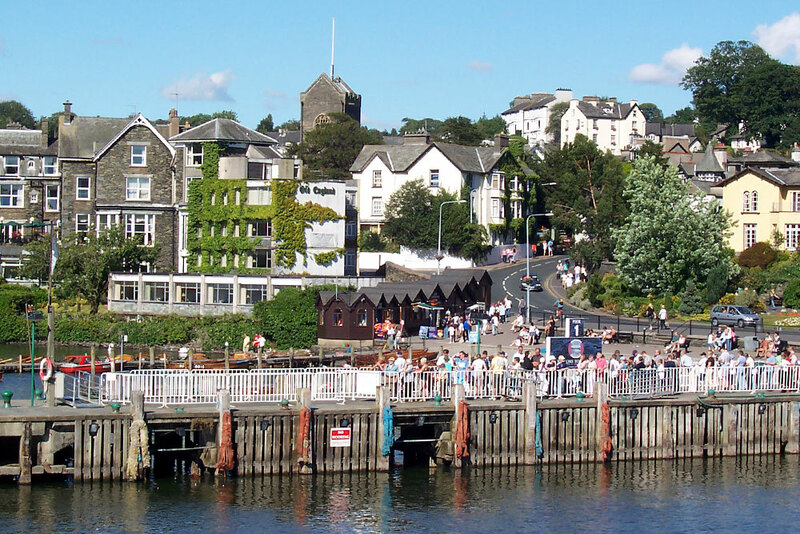 Windermere is one of the most popular spots in the Lake District. 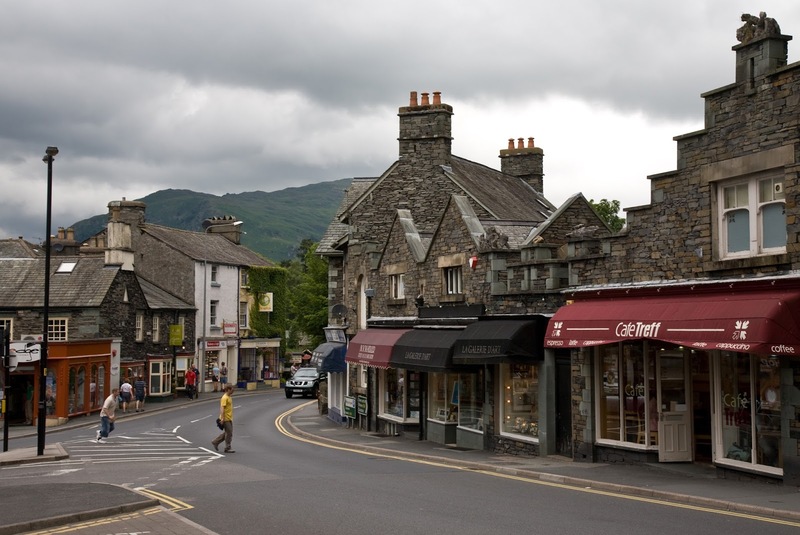 If you want solitude and quietude then roam through the valleys and mountains, but if you want a genuine holiday atmosphere away from the seaside, Windermere will provide. We went the several times, both as a family and on a Lion's reunion. The lake has a lot to offer with some busy quaysides and gentle boat rides. The town (and others around the edge of the lake) is bustling with shops and refreshment houses abounding. Windermere itself is pretty. The local stone features heavily in the construction of the houses, but so does timber. The land rises quite steeply in places and it isn't difficult to find a pub with a patio that provides the perfect vista. 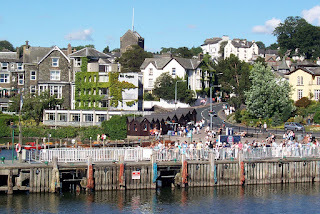 Bowness on Windermere is just as lively and has the feel of a seafront stop off, especially as many of the boats call in there. But the main attraction to many is the World of Beatrix Potter. 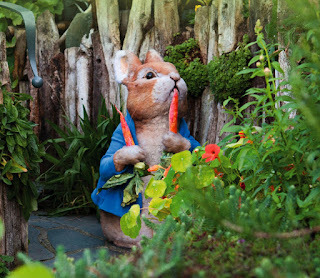 Even as an adult I found this a great venue, but better still if you have well read children with you because this is the tale of Peter Rabbit in 3D. When I was young I was very impressed when my sister got a fur coat for being good. It was quite a few years before I realised what she was good at. I haven't been much use to Pauline this week. She is going stir crazy and the only day I could have taken her out I ended up at Heartlands with Nick. The weather is being really nasty (albeit warm) so I can't just put her in the wheelchair and push her round the estate. I started on the Stevenage TN as quickly as I could and hadn't finished it when Graham and Sandra came for an hour or so. Luckily there was no Live at Home Scheme for me this week so I was able to finish it after lunch. It was grim when I got to the studio at 5.30pm but the mood lightened as a full house of helpers turned up. Wilf was first, followed by Keith and between us we finished Gwent, Stevenage and Scotland before the Lichfield readers arrived. Ben was there, which helps me a lot, and only Peter Fox was missing, having succumbed to a booze cruise to the Spanish sunshine. Outrageous but understandable. We finished just before 10pm and found rain as heavy as I've known for a good many years. The only time I can remember when it was worse than this was a typhoon in Hong Kong! 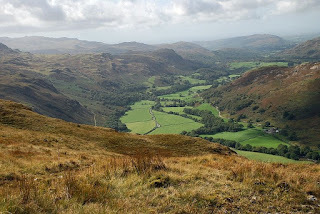 Eskdale is a walker's dream. 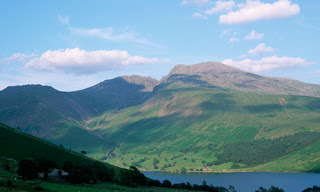 A long, verdant valley leading from the coastline right up to the Scafell Pike region. Britain's mountains may be small by some standards but that doesn't mean they can't be dangerous. 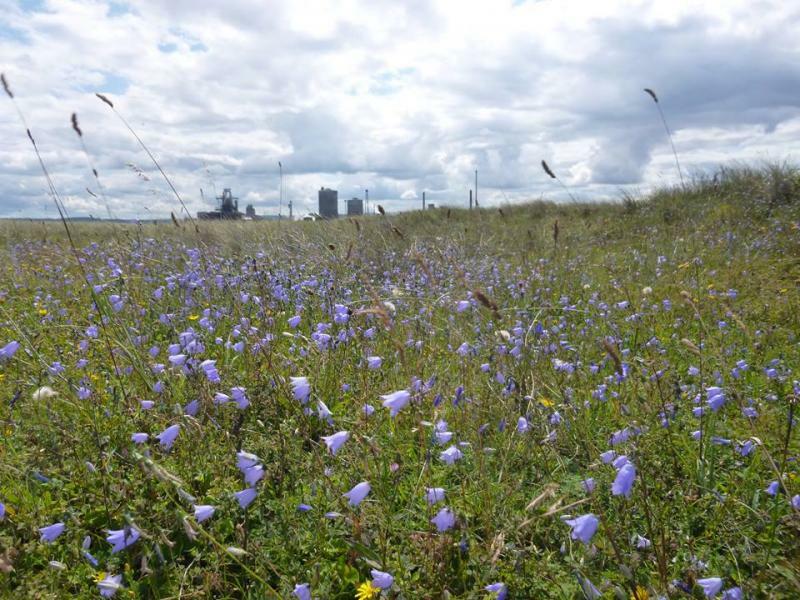 In a country that is becoming increasingly packed to the seams in some regions, there are great swathes of wild open places, especially in Cumbria. 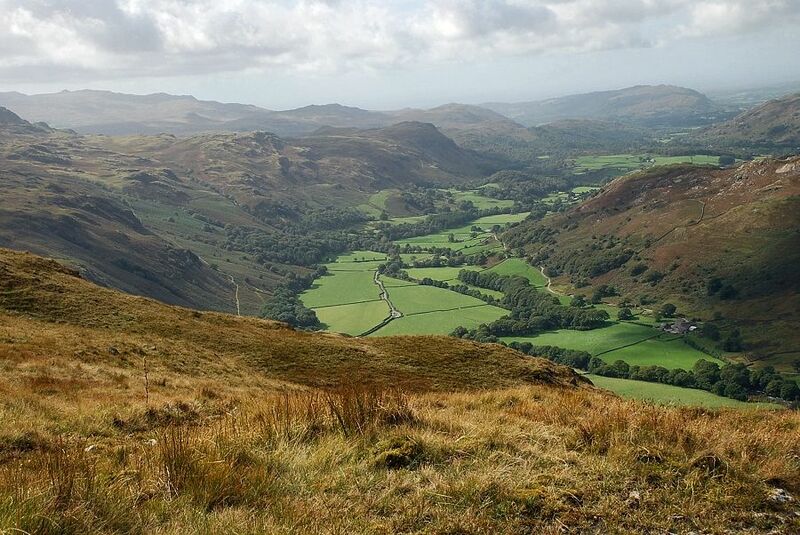 Eskdale hosts just two villages but is a Mecca for the determined walker. It is unusual in Cumbria in that it doesn't have a lake to circumnavigate. There are over 50 bodies of water in Cumbria but only 16 of them are considered to be lakes. Of those, only Bassenthwaite has lake in its name. All the others are waters, tarns or meres. Hopefully we will get back to the Lake District in the next two years. I may no longer be up to climbing Scafell Pike (though it isn't hard by most standards) but there are still a lot of places to explore. I did some paperwork first thing and then collected all the returns. Pauline was starting to feel quite down because of the enforced inactivity, but also because Rita can't come to terms with it. Fortunately Gill came to see Pauline for a couple of hours which meant I could process the returns without abandoning Pauline. This afternoon I downloaded all the Welsh and Scottish news and took everything to the studio. I got a few ingredients for tonight's meal and then said I would sit and keep Pauline company. We picked a Nicole Kidman film to watch, got to the climax and 17000 houses in Lichfield were plunged into complete blackout, apparently from a fire at a relay station. I paid no attention to Kendal the first time I went there. 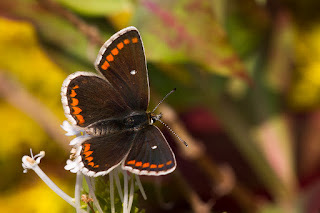 I'd never heard of the place and my head was full of what I would find at Ullswater. Once at the Outward Bound School I heard the name Kendal a lot, because no one was allowed out unless they had Kendal mint cake in their rucksack. I don't know if it's still the same but no one went anywhere near a mountain unless accompanied by this seeming life saver (including to the top of Mount Everest). Fifteen years later I went back with Pauline and children that would have been too young to remember. Kendal was very much a market town in the 1970s and its main charm was around the bridge over the River Kent, which is an interesting river as it passes through the town, looking up at defunct mills that are now tidy dwellings. Kendal is quite close to Lichfield in size and both places are on the tourist map. Kendal had its castle whilst Lichfield had its walled cathedral. There were several castles close by, all of which failed to make it to the present day. The mills produced woollen goods, especially in Kendal green. Carlisle was a far distant place in my youth, famous really as the last stop for eloping young couples before crossing the border to get married in the local blacksmith's shop in Gretna Green. That was all still going on when I made my first trip to Scotland and made the obligatory stop off. Going back and taking a more leisurely look. There was, of course, a castle and over its 900 year history it played a few important roles, even holding Mary Queen of Scots for a while. Now managed by English Heritage, it needs some work to bring it up to the standards of some other northern castles. What global warming? It's no hotter now than it was in August.